Nearly every water heater manufacturer has been suffering from call backs on quality control these last couple of years. There have been many changes in the water heater industry and those changes have come at the expense of the consumer. Most manufacturer of water heaters are from Mexico and overseas where labor is significantly cheaper, but quality control is always an issue. 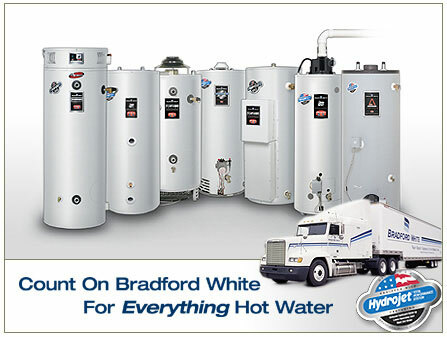 We can install any brand of water heater, but we prefer Bradford and White. It has a great track history of not breaking down and not flooding homes as some of the other manufacturers do. Bradford and White, the last American Made Tank? The Bradford and White Hydrojet system stirs the water every time you use hot water in your house. This system helps to keep the annoying and tank destroying calcium and mineral buildup from occurring in the bottom of your tank helping to extend the life of your water comfort system. The Defender Safety System comes from Flammable Vapor Ignition Resistant technology or (FVIR). This system ensures that no flame escapes the combustion chamber and enhances the safety of this water heating system over older models. Your water heater doesn't have to be a bomb waiting to explode. The two pipe systems incorporated into the power vent system provides an extra level of safety from carbon monoxide as well as efficiency. By using outside for combustion the venting doesn't pull any air from inside the home. This prevents the home from acting like a vacuum and pulling in unconditioned air from the outside. Have a hard to vent location? This power driven vent allows the water heater to vent directly through the wall rather than all the way up through multiple stories allowing for unusual placement of the heater. Great for remodeling and heater relocation. Commercial high efficiency water heating include this power vent model that uses external supply air and fully seals the combustion chamber from the inside or living area. Safer, more efficency and long lasting these water heaters are the core heating systems of choice. 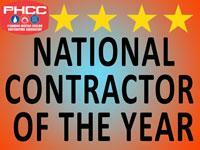 What does a quality installation encompass? What kind of manufacturer warranty should I get? Manufacturer warranties only include the tank after the first year. Some have extended warranties for parts for a few years, but the labor isn't covered. No protection from dealer handling fees. Many local distributors charge a $50 to $150 fee to handle the new water heater when it is under the manufacturer warranty. You won't be charged this fee from The Empire Family of Services. No protection from installation labor. We are the only company in Southern California that I know of that does not charge to install warranty waterheaters for our maintenance clients. Most companies will charge you between $150 and $300 to install a under warranty replacement water heater. Not the case here at The Empire Family of Services. Your charges to replace a warranty water warranty could be upwards of $600 and all the while you though you were covered by the manufacturer. What kind of guarantee should I get from the installing company. Over the last few decades we have found out what our clients want in a warranty. They want to know that when they choose us as their plumbing company that we’re going to deliver exactly what it is that we say we’re going to deliver. That there’s no chance that you’re taking a risk, that there’s no chance that you could be making a mistake in choosing us, that there’s no way that you can lose in choosing us to perform these services for you today. 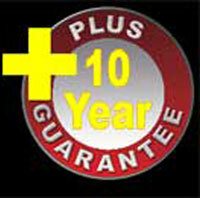 Because of this need for Peace of Mind we offer rock solid guarantees. 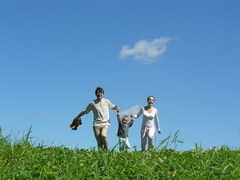 What our 100% satisfaction guarantee says is that if you are not 100% satisfied with what we’ve performed, then we’ll make any modification necessary, any modification required, to gain your 100% satisfaction, up to and including replacing the equipment or repair or refunding your money, all of your money. It’s not just our goal, 100% Satisfaction; it’s your right as a consumer. If you’re not satisfied, were not satisfied. What our guarantee says is that once we make a repair, it is repaired for life. That's Total Comfort isn't it. If any repair that we have made fails to perform the way it should, we'll come out and redo the repair for free, parts and labor or we'll give you back all your money. Your in charge of the repair in your home. If you're not satisfied then we haven't done our job properly and you shouldn't have to pay a single penny for it. 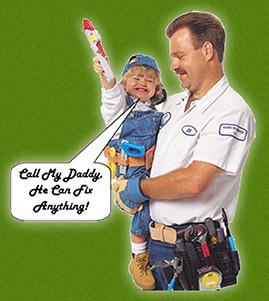 We are the only plumbers in town that guarantees that our plumbing systems will do exactly what we say they'll do. If the tank or any part on the water heater that we provide and install fails to perform perfectly for the first 10 years, we'll repair that waterheater or replace that waterheater for free. That's free parts and labor for a Full 10 Years. 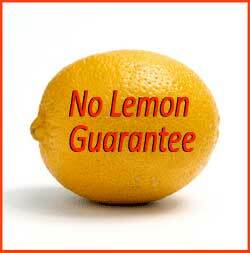 No one deserves a lemon or a warranty that doesn't cover everything. If any portion of the copper piping that we perform fails in the first 10 years we will fix or replace that piping for free. This includes angle stops and supply lines, tub valves, shower valves and ball valves. No one should have to pay for a home re-pipe twice. You only pay once for the repair. This is just one more reason why the Empire Family of Services is the preferred plumbing company for about 12,000 households each year in Southern California. No charge means absolutely no charge. 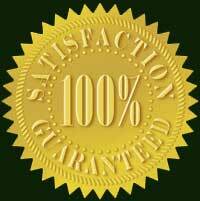 No other company offers this rock solid guarantee. If anything is accidentally damaged, a professional will repair it. We’re not going to be driving down to the Home Center parking lot and pick up someone to bring to your home. 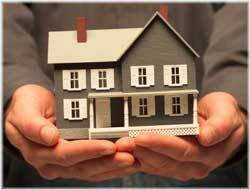 You will have a properly licensed, a properly insured and properly bonded professional perform the repair. Once the repair is done to your satisfaction, then and only then do you have to make your investment in your new plumbing system. With a guarantee like this do you think that we will be sloppy or do you think that we’ll Treat your Property Carefully? We're the only ones making this kind of guarantee. We want you to test drive your New Home Copper Re-Pipe through all four seasons to make sure that it meets and exceeds all of your expectations. You’ll be using your new Home Copper Repipe System through the cold and clammy winter season, you’ll get to drive through the sneezing, sniffling asthma season, spring, you’ll get to cruise through the hot and muggy "I can’t sleep at night" summer season and finally your going to be able to triumph through the cold and flue season, fall. After you’ve passed through all of these seasons only then do have to make a decision. If you're not satisfied with the performance of the Re-Pipe, if for any reason or if for no reason whatsoever you are not satisfied with this system, give us call and we will refund 100% of your investment and we’ll give you interest. 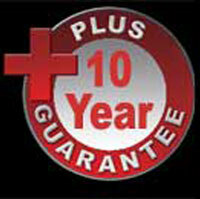 Why do you think no other company will give you this type of guarantee? If we perform the maintenance on your sewer system Re-Pipe or your copper system Re-Pipe for the first 10 years then you will have no out pocket repairs costs whatsoever. If anything breaks or stops up, we'll fix it or replace totally at our expense. You may never pay for a repair again. Isn't that peace of mind. 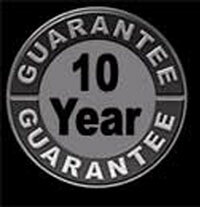 Pipe repair, pipe replacement, all porcelain products are warranted for 10 years as long as you are a maintenance agreement member. This does exclude useable parts such as filters, flappers, pressure regulators, ballcocks. Water heaters, disposers, shower valves, bathtubs and more are guaranteed for 10 years all parts and labor when you are a maintenance agreement member. You may never pay for another repair again. 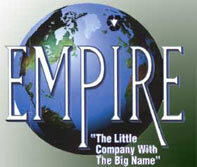 Calling The Empire Family of Services, Plumbing, Heating, Cooling & Electrical, is easy and On Time. If we don't make our appointment time because of us, your minimum service fee is waived. The minimum service call is free. 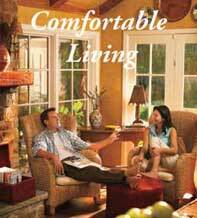 You shouldn't have to be left out in the cold or the searing heat because of your Home Comfort Company. We're Always On TIme, Guaranteed. At The Empire Family of Services, we are confident in our system design skills, the equipment we offer, and the quality of our installations. We guarantee that we will meet the design temperature of the water at every fixture in your home at full usage when we install a Tankless water heater. Your system will be designed with a matched gas connection line and properly wired electrical circuit giving you a certified combination engineered to achieve the manufacturer tested hot water output. We will install the equipment, can test the water flow, and we will ensure that even the largest and highest use water fixtures in your home have an adequate hot water supply. If it doesn't, we'll repair, replace or upgrade at no expense to you. This guarantee reflects the unusual commitment to engineering detail, diligence, old fashioned craftsmanship, workmanship, and pride we put into every Home Water System we install. You may never pay another penny for a repair for the next 10 years, guaranteed! We are a full service plumbing, heating, air conditioning and electrical service and repair company here in Southern California. With shops nearby we are typically on the job within minutes, not days. Give us a call at 1.877.247.6426 and find out for yourself the level of service and professionalism you've been missing. Call now and then, relax, we are here to lend you a helping hand. Energy Factor (EF) is an overall efficiency rating of the water heater. The higher the EF, the more efficient the model. Water heaters with high EF ratings may cost more initially but save energy and money in the long run. Eventually, they will pay for themselves through a lifetime of energy savings. Gas instantaneous water heaters with input ratings greater than 50,000 BTU/Hr. but less than 200,000 BTU/Hr. Another important factor in choosing a water heater, the 1st Hour Rating is an indicator of how much hot water a particular model can provide. The rating, in gallons of usable (desired temperature) hot water is reached by combining the amount of usable hot water stored in the tank plus how many gallons of usable hot water the water heater can generate in one hour of operation. For example, if a 40-gallon natural gas water heater will store 31 gallons of usable hot water and can deliver 41 gallons of usable hot water in the first hour, it’s 1st Hour Rating is 72 gallons. 1st Hour Ratings are included in the Energy Factor charts. The Energy Factor Chart is subject to change without notice in accordance with our policy of continuous improvement. The water heating system you choose matters, but doesn't matter anywhere near as much as the person that puts it in and the company that backs up that installation. Through regular training and retraining we here at The Empire Family of Services have developed the most advanced systems and methods for proper installation and maintenance of water heating systems. That is why are are able to offer you a full 10 years parts and labor on each water heater installation installation. All guarantees and warranties are in writing on your agreement. See your agreement for full details. Plain writing, not attorney driven. Relax, you've called a professional.